Stitched Together: How did it get to February???? How did it get to February???? I don't know where this year is vanishing to. Someone is stealing my days! I feel like I don't have much to show for January at all, but at least I have something to motivate my February. Last year I took part in the Weekly Photo Challenge, which I really enjoyed. You can still look at the photos I took here. As you can see, I trailed off towards the end, as Christmas approached. I don't feel the need to do another tightly organised weekly challenge, as I did find it difficult being tied to the house a lot of the time. It's really hard to take Urban photos when you can't get out of bed for a few days. I decided that I would set my own challenges and just try and take some photos each month that are not for any purpose other than being attractive photos. 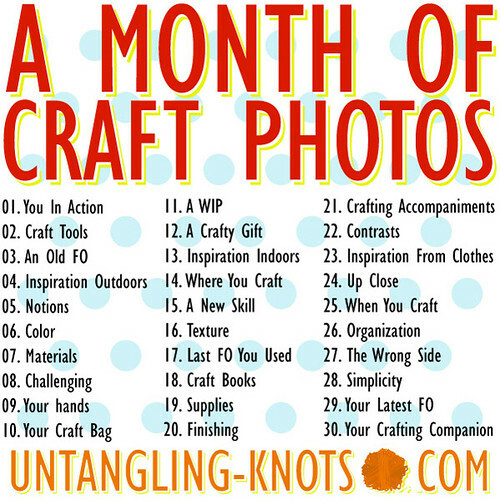 I was quite happy with that plan until I saw Andi's idea on her blog, Untangling Knots. Andi has decided to take photos surrounding the subject of her craft, each day of the month of February. And she has invited other people to join in. You can read all about it here, if you fancy joining in. The daily subjects are show below. I don't think I had really decided to join in until this morning, when I started taking photos for today's post and thought, you know what, I can add an extra photo as this is based around my home. So I did. Here is my photo of "01. You In Action". Do you recognise the sweater? I think this challenge is a really good idea for me. It's something I can do, because I don't have to go outside to do it. It is around the subject of my crafting, which I would be taking photos of anyway and it will keep me focused on blogging this month. I probably won't post the photos on here every day, but if you are interested, I will be uploading them to my Flickr set. Maybe later in the month I'll share some more, if anyone wants me to. 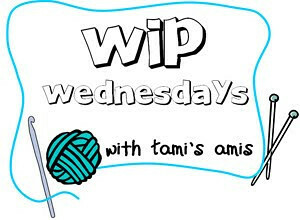 The above photo is actually quite appropriate to a Wednesday post, as today is WIP Wednesday. 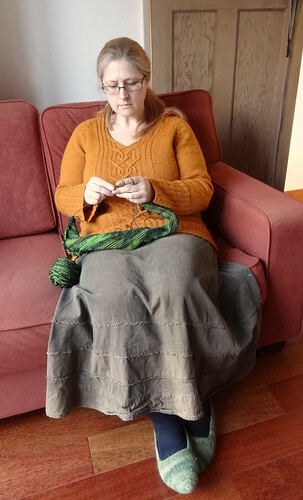 The knitting in my lap is my latest project, a Lazy Katy Shawl, by Birgit Freyer. 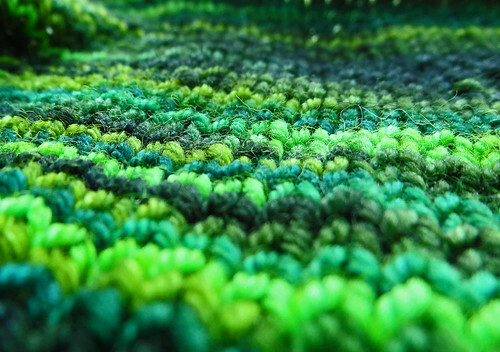 The pattern uses a single skein of sock yarn to make an asymmetrical shawl. 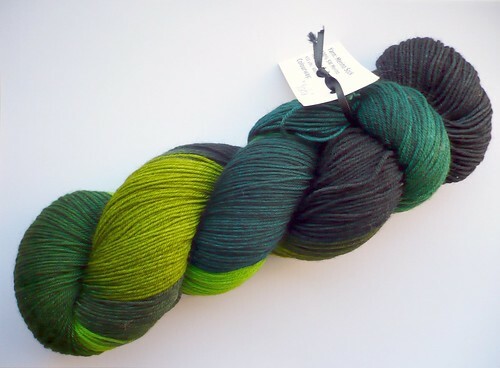 I decided that I would use my BabyLongLegs, Merino Sock in Yoda, as my fingers have been twitching to knit with this yarn since I got it. Most of the versions of this shawl, I have seen, have long colour changes, which this yarn doesn't, but I don't think that will matter too much when it is wrapped around my neck. 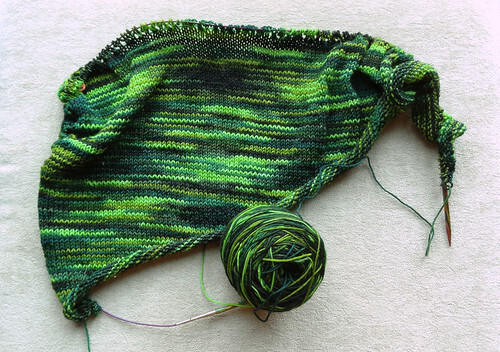 I quite like the pooling, but I don't know how much it will hide the lace edging. I've done the main body of the shawl so far, and have just picked up around the outside edges, ready to start the lace chart. This will be a chance to use the new Chart Folder! So until I have any more progress to share, here is a gratuitous close up shot. And yes, those are the true colours. They really are that saturated! If you want to look at other works in progress, click the button.